Combine pasta, chickpeas, olives, tomato paste, garlic, rosemary, oil, pepper flakes, and 5 cups water in a large straight-sided skillet. 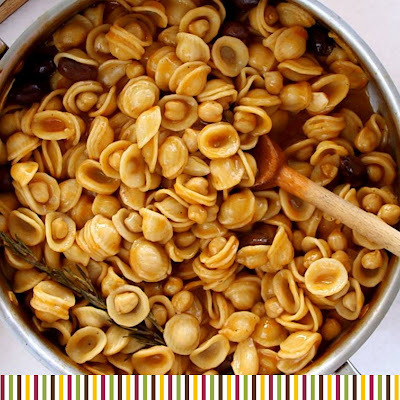 Bring to a boil, then cook over medium-high heat, stirring occasionally, until pasta is al dente and liquid is reduced to a sauce that coats pasta, 12 to 15 minutes. Remove skillet from heat, discard rosemary, and stir in cheese. Add more water, a few tablespoons at a time, to thin sauce if necessary. Divide pasta and arugula among bowls and serve immediately, drizzled with oil and sprinkled with cheese and pepper flakes.